Responsive template design is the latest trend in Web design and development market. This is a such kind of design where the width of the design is fluid and it can caters for any possible screen resolution. It means a single responsive template can be used as a single tool that help to serve your website to any media formats and devices which visitors uses to access your website. So, now you do not need to maintain separate templates or plugins for separate devices like Computers/Laptops, Tablet PCs, Smartphones. If you use a single responsive template it will provide you the best possible solution that can handle all kind of devices. As a die heart fan of Joomla CMS, here I can not able to restrict me to list all the FREE and best Joomla templates that have responsive layout structure. As I personally think Joomla is the best content management system and as the responsive template concept is the latest concept in Joomla template development, this is sure the demand of responsive Joomla template will increase rapidly in next few years. I will surely upgrade this list time to time accordingly. But for now this is the best possible list as per my opinion and review. It is always a challenge coming up with a new template to suit the unique needs of customers. GavickPro certainly accomplished this goal. At no cost, with this template make your own music website that will catch your visitors’ attention. Thanks to the Gavern Framework upon which this template is based, the specifications of Responsive Web Design have been implemented. GavickPro have thrown in support for the Tabs GK5 module with native support for horizontal layout scaling based upon the type of device display. In addition, this free responsive Joomla template supports the modified News Show Pro GK4 extension and the K2 component which enables information to be displayed in attractive and unique ways. Even more, this free Joomla template supports the mooMasonry script which blocks modules to be positioned such that the available space is optimized for the target device. To recap, this responsive Joomla template incorporates support for the K2 component, Tabs GK5, and News Show Pro GK4 to meet your current and future information publishing needs – on whatever platform your visitor is using! JA Elastica – Joomla! responsive template and is completely free licensed under GNU/GPL V3. Web has spread to mobiles, tablets, notebooks and other handheld devices. Do you think your site is ready to serve them all? 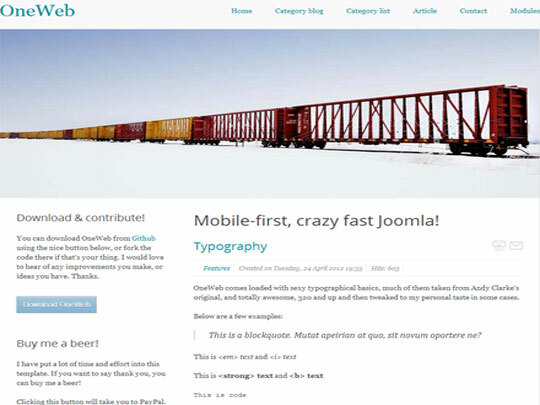 Responsive Joomla! templates are the answer to such now common design requirements. One template to serve them all. 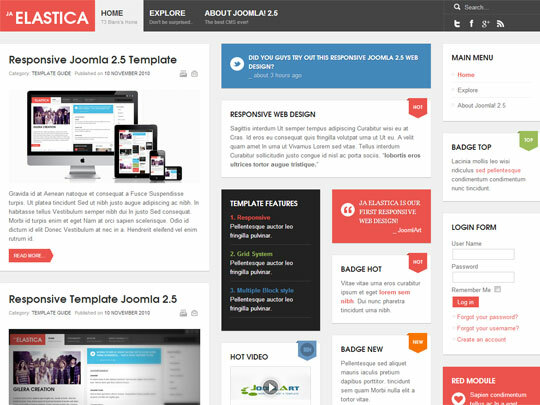 Responsive joomla! template as JA Elastica adapts and transforms to fit the screen area of the devices, now be it extra wide monitors or be it iPad, iPhone or the android powered beauties. Built upon JA’s robust JAT3 2 Framework and jQuery Masonry script, JA Elastica works well and fits well on all the web enabled devices and mobile browsers. JA Elastica is free to download / use / distribute – that’s the power of GNU/GPL releases. This template does not support RTL CSS style. 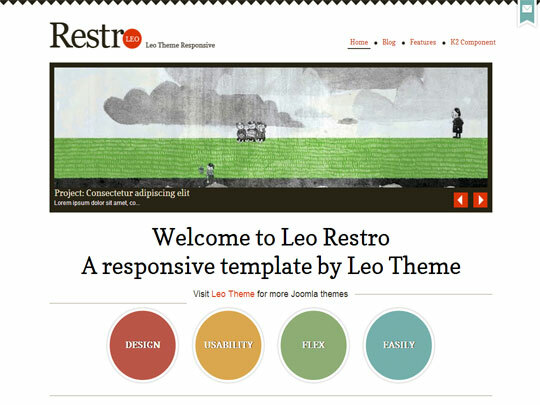 Leo Restro is a Responsive Template for Joomla, adapting to the Resolution size of smartphone such as iPhone, Android and Other mobile devices, Table-less. This is an interesting theme ideas for showcase, portfolios, blog site. It comes with 3 amazing themes color, clean styles and support customize changing background, text-color, font-size..etc via the template configuration. And More supports themes for K2 component, is built using our powerful template Framework called Leo Framework – giving you the ultimate flexibility and speed. The Vertex Joomla Template is a 100% free GPL licensed template, now with Responsive Layout! It’s purpose is to show off the powerful features of the Shape5 Vertex template framework. 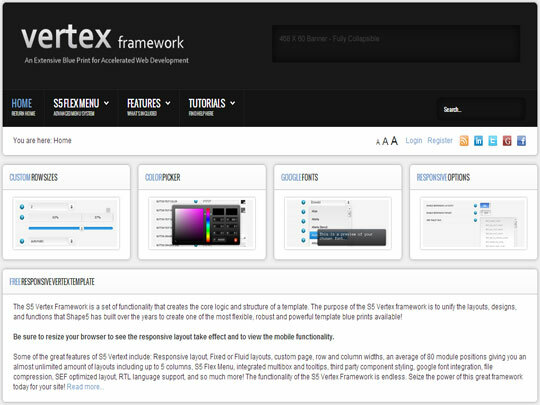 That’s right you get all the powerful Vertex features for free such as the S5 Flex Menu, 94 module positions, mobile device version, hide the component area on any page, custom row and column widths, RTL language support, and so much more! Unlike many free templates from other providers, that lack options or visual appeal, Vertex is not only packed with options but it looks great too! Consider it as a gift to members and a celebration of the new Joomla 2.5! Customize the look of the theme with your own custom highlight colors and font, and use it’s thousands of layout options to make your site truly unique. Be sure to check out the demo. To help you manage your website in the proper way and save your time, TemplateMonster are pleased to offer their great Responsive Joomla templates which will perfectly assist you in building your website that will adjust to any possible screen resolution. The main peculiarity of Responsive Joomla template is that being created on Joomla open source content management system, this high-end product has also such evident advantage as additional layout options for many different screen devices. There are 4 primary layouts: desktop (980px); tablet (768px); smartphone landscape (480px) and smartphone portrait (320px). You and your site visitors can enter to the website from any device without problems, because responsive design keeps its original structure. You can also look at the original template that has the same design, but just another theme. You’ll be surprised checking out our constantly growing collection of Responsive Joomla templates which includes various topics and categories to fit any business field. Please note that this Free Responsive Joomla sample was made for educational purposes only. 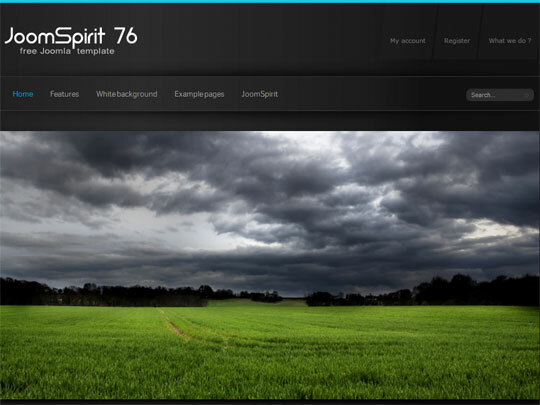 This means that you can’t use it for any commercial projects or resell the template. 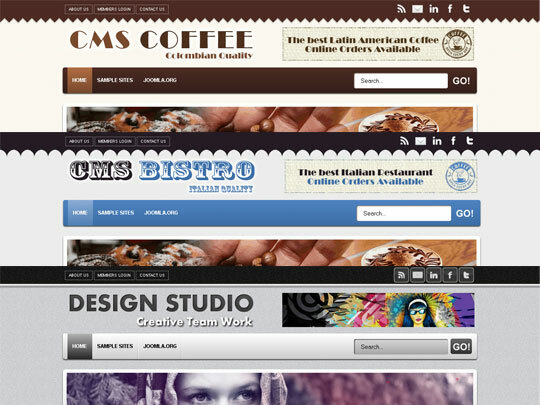 CMS Water & CMS White are 2 separate template but containing same theme but with different color scheme. Features are all same. And most of all the design is responsive design. CMS Grey, CMS Blue & CMS Brown are 3 separate template but containing same theme but with different color scheme. Features are all same. And most of all the design is responsive design. Responsive Design: A single design for all devices : mobiles, laptop, desktop … This design should automatically adjust with your screen resolution. HTML5 & CSS3: HTML5 template : better for your SEO and ready to the future. CSS3 features : a clean code, no image, animation and a website easy to customize. Lightweight and fast as hell, Google font goodness baked in, Clean, semantic markup, Plenty of module positions, logically named and laid out, WAI-ARIA Landmark roles, Built according to Vulcan standards of logic, Google Analytics integration. Thanks for sharing your thoughts about Joomla Templates. Can you recommend me a good Free Responsive Joomla Template? You can use the “Vertex – By Shape5”. 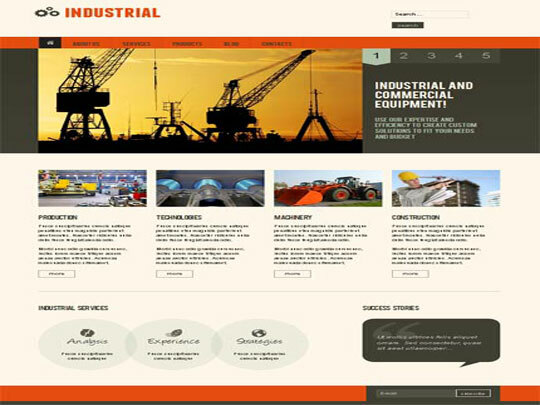 As this is a framework template you can able to customize it as per your needs. thank you for share! thank verry many! I recommend other template avatar simple with responsive function. We agree with Template Monster! Great work! Great round up! Thanks for mentioning TemplateMonster’s template. At our website you will also find other free templates of great quality.